3 Homes on approx. 59 acres/approx 1000 ft of paved frontage. 50 plus MORE acres may be added.Fish pond, barns for animals, level pasture. Great development potential. Nice timber on property. City water access at front, city sewer access at rear (both require connection fees). Enjoy rental revenue and/or live on site.2nd liv qtrs is detached brick house (electric baseboard heat & AC window units), approx 1300 sq ft. 3rd house is 2 bedroom, 1 bath brick ranch overlooking pond with heat pump. All houses share well. Approx drive times:I-85:10 min, I-485:10 min, CLT uptown:30 min, USNWC & CLT airport: 20 min. NO DRIVE-BYs please. All homes currently rented. Listing agent is owner/seller. A slight crossing at the rear of proposed roadway on future thoroughfare plan. 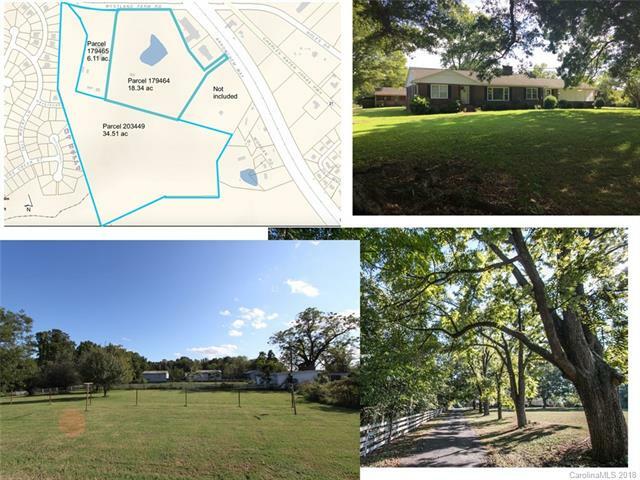 Property is also listed for sale as acreage (MLS 3351429).Seller must retain a right of way to acreage owned that is adjacent to the rear of this property. Listing Courtesy Of: Scott Farmer Properties Inc.